May is often a month of sore feet for me. After a winter of climbing short and very steep things, when I start trad climbing my weak and unfit feet get kind of sore. I remember having this problem particularly badly a few years ago on my first visit to Cloggy one june after a month of climbing upside down in the Anvil. Kev Shields making good progress on his project. 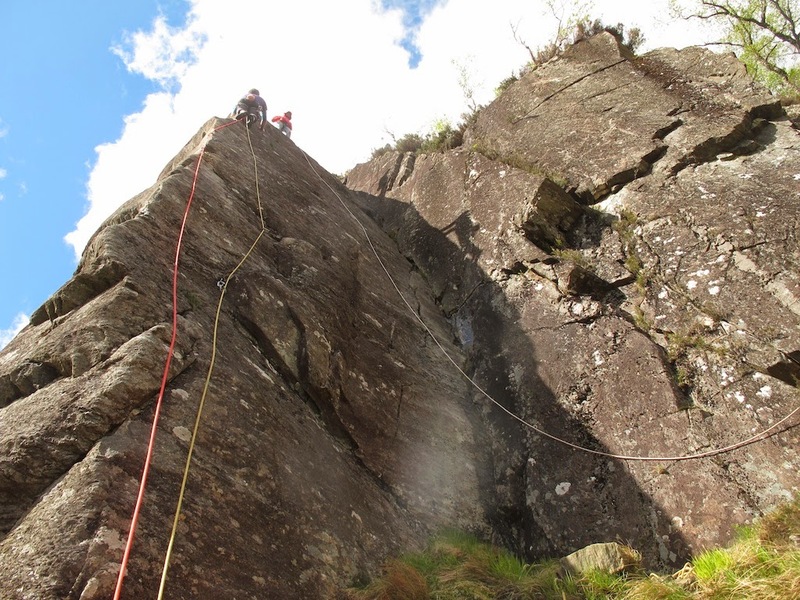 So today I joined Kev, Steve, Joe, Dot and Ewan at Wave Buttress for some slabby wall climbing and toe endurance training. Kev has been working away on a project up there which will be a nice E7 6c. He toproped it with apparent ease today and was looking strong on it. I had some laps on it too and enjoyed myself in the May sunshine. 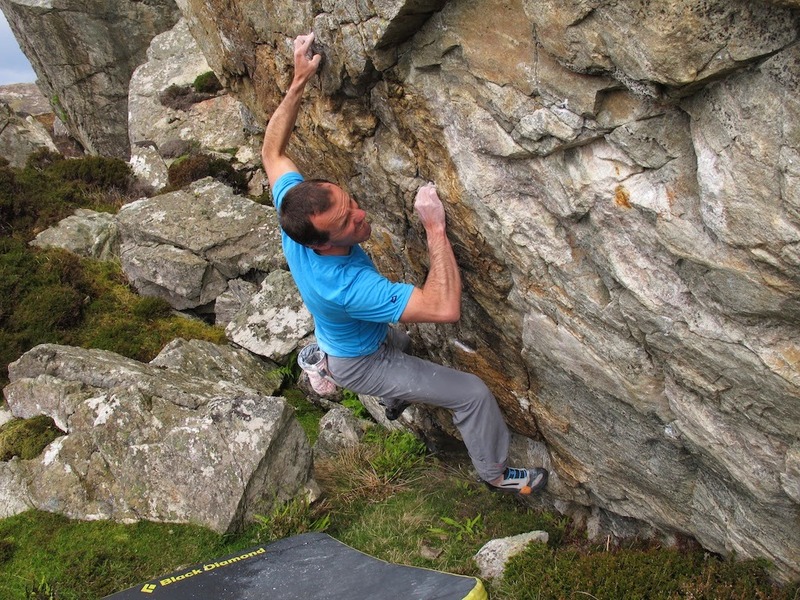 It has a very thin thumb press move with just enough gear to entice you on, followed by a sustained E6 6a to the top. Joe and his shadow leading Edgehog E3 6a. Afterwards I went round and did Romancing The Stone E5 6a with Joe. It was a little dirty in places and I took my wire brush with me to clean the odd hold as I went. As predicted, my feet felt worked. I enjoyed the route finding, although another decent runner on the lower part would’ve been nice. The other guys were giving On The Beach (E5) some traffic. 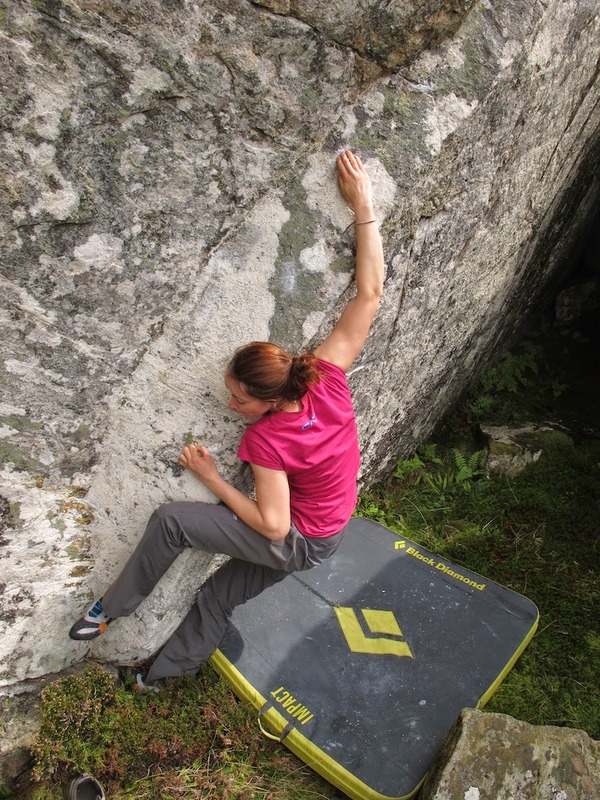 Natalie on a thin groove problem on Harris on our pre-ferry boulder session the other day. It was a little hot for crimping this hard. That's my excuse anyway. Natalie Berry enjoying The Prozac Link, E4, Screaming Geo, Lewis. 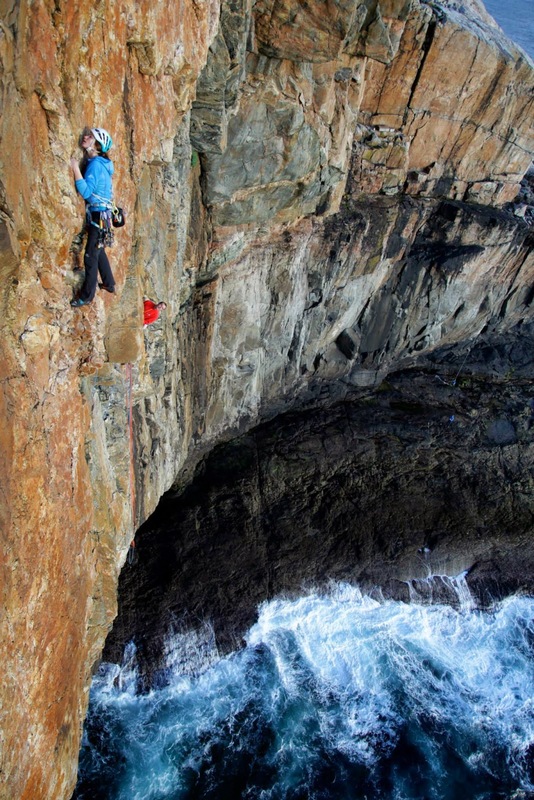 Natalie Berry has been a very successful youth competition and sport climber for several years. 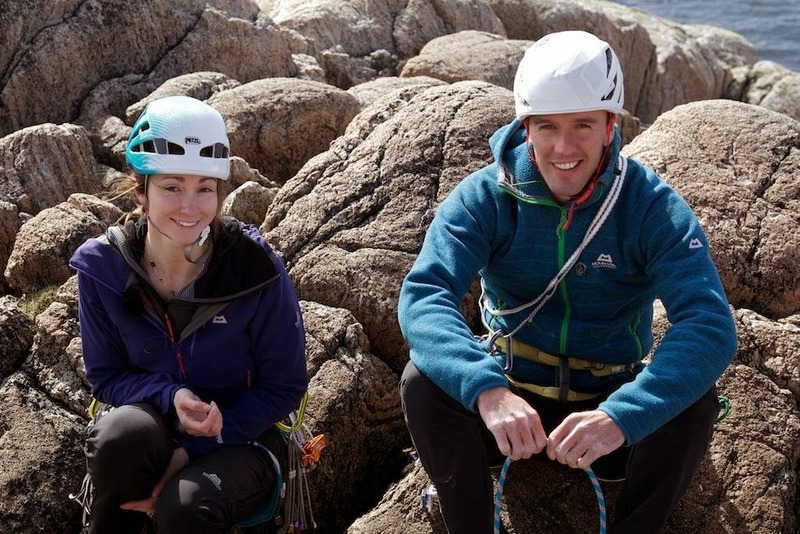 Now in her early twenties, with podium places and 8b red points under her belt, she is motivated to move into adventure climbing and has just started trad climbing. 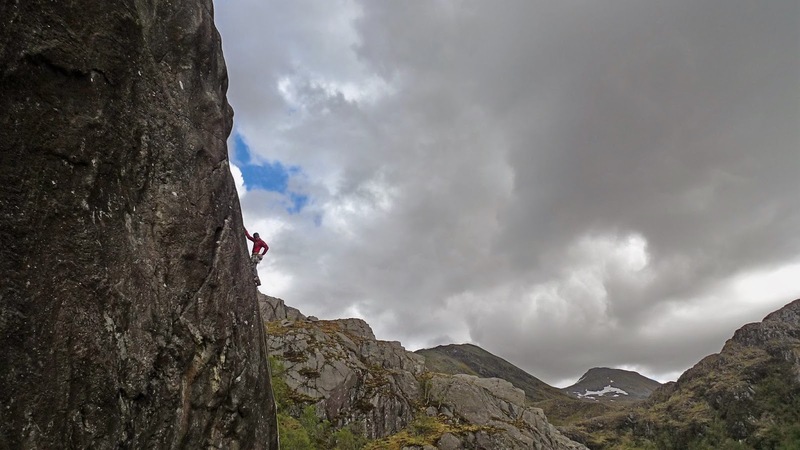 We had a few days booked in to head north and get some routes in, taking the Hot Aches Productions crew with us. Although I’ve known Natalie for many years from our days living in Glasgow, we’ve never climbed outdoors together until last year. These days we are colleagues on the Scarpa and Mountain Equipment teams too! The poor forecast told us to get the ferry to the Western Isles for the best possible chance of dry rock. 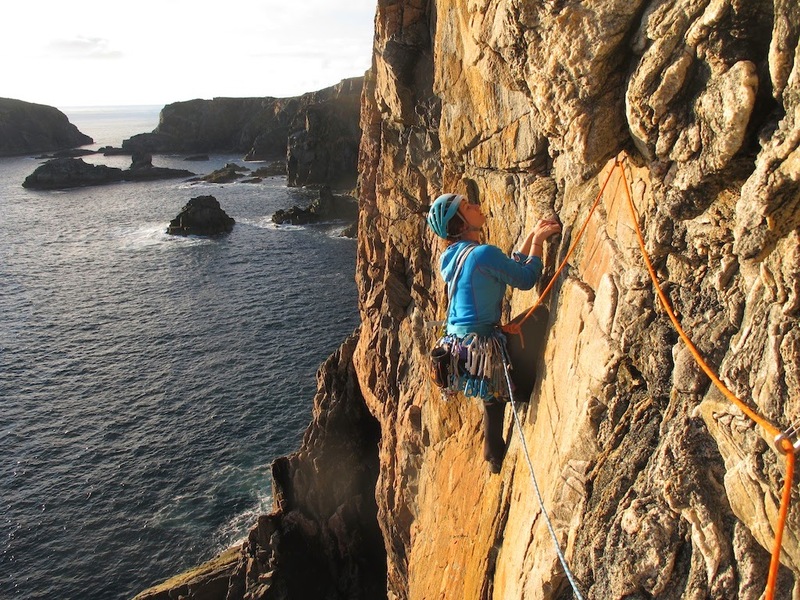 With a wealth of mountain and sea cliffs of all different shapes and sizes, and plenty of new routes still to explore, Lewis and Harris are always still high on my list of places to hit when the warm weather arrives, despite the fact I’ve climbed there a lot over the years. To be honest, I like to go there for the general vibe of the place even more than the climbing. Stress tends to disappear here. After 5 days here I feel like I have more energy than I have for many months. 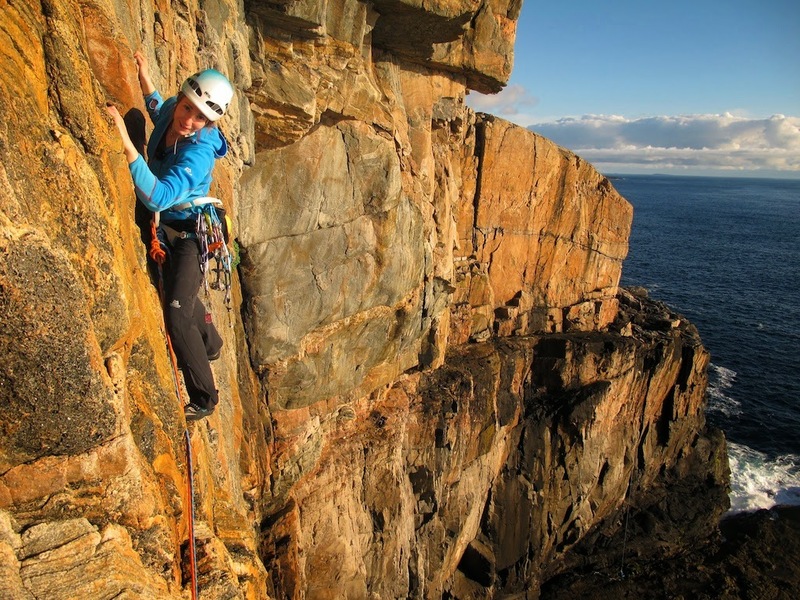 On our first day, the mountain crags were looking a bit windy, wet and cold so we ended up at the Uig sea cliffs, where Nat dispatched her first E1 with ease. 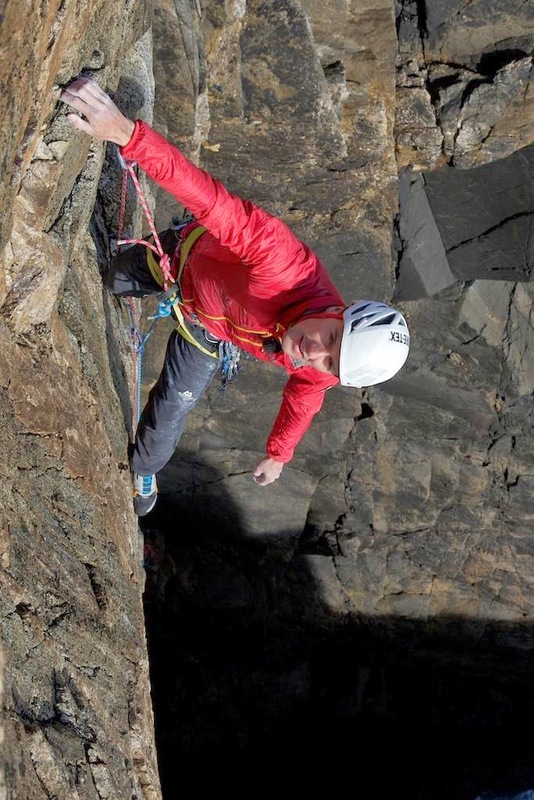 She was still looking a little uncertain how to approach trad pitches; arranging the protection, breaking the pitch down into chunks, and dealing with ‘trad’ type features of wet jamming cracks loose rock and the odd bird. I got a nice E6 done, initially thinking it was new but later finding out it had been done by Jacob Cook recently. 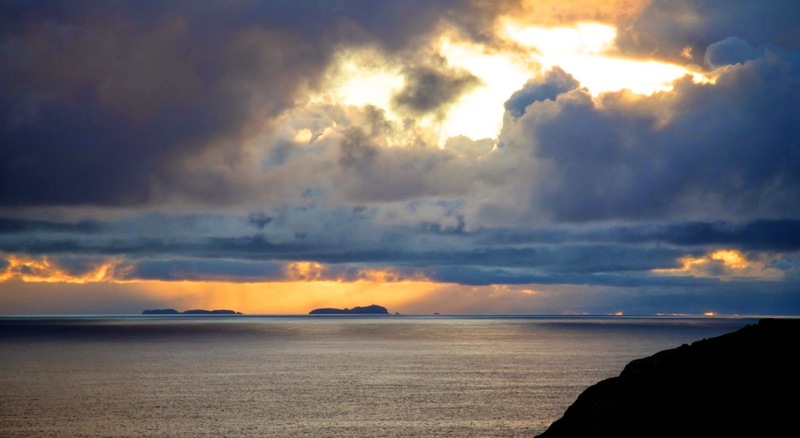 Good to see some other folk visiting the islands and putting routes up. Repeating a nice E6 at the Flannan area. Photo: Hot Aches Productions. 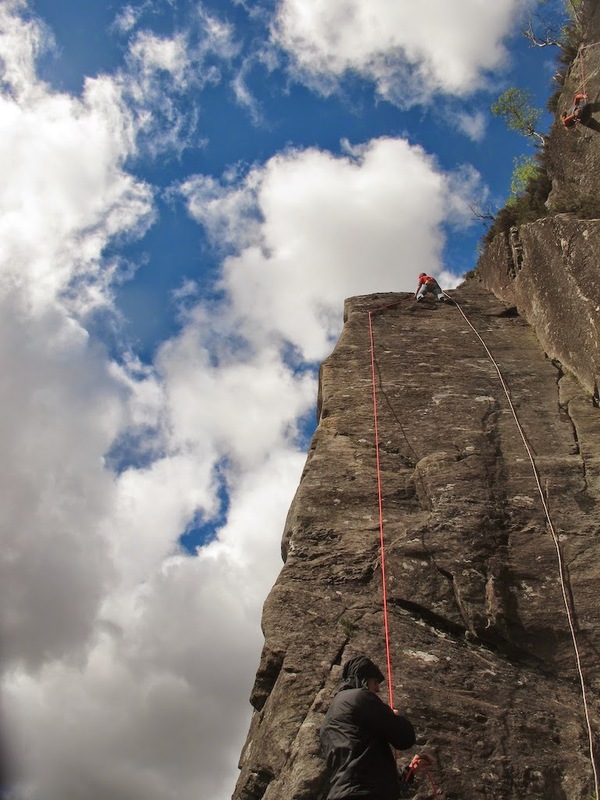 The next day we went to Aird Feinis with Cubby’s excellent Top Tackle Tips (E6) in mind. But big waves battering the base of it prevented us. So we had a top rope play on two new routes, one hard E7 and the other hard E8. Nat also had a play on the E7, and obviously had no trouble doing the moves. On day 3 we visited the Boardwalk where Nat onsighted an E2, again without any bother at all. I climbed one E4, then backed off another soggy one. At the end of the day, Nat went for an E4 with a bouldery crux right off the ground. After some deliberation about where to start, she pulled off the ground, only for the very first hold to break off a nanosecond later. Nat plonked down on her bum on the wave platform, and we laughed that she survived her first trad groundfall. I tied in and tried another hold that stayed on the wall. 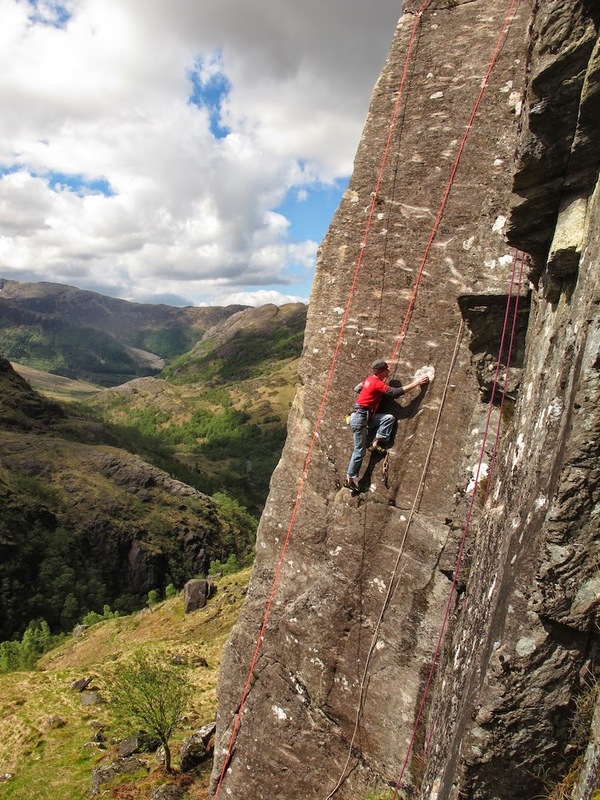 An obvious good objective for the trip was the super classic Prozac Link (4 pitch E4) in Screaming Geo. It’s widely regarded as among the finest E4s in Britain, and it’s a mega trip across the great arch; guaranteed to provide an adventure. We started up it in glorious hot sun, but cracks still damp from the sea spray, so I led. The next two pitches had a couple of wet holds or unobvious gear so I led those too, and both of us were enjoying the increasing exposure. Hanging on the belay before the final and crux pitch, I thought it would be interesting to see what Nat decided about this pitch. Would she lead? On such a classic route, on a great day, it seemed like a good moment to take a step up. Would she feel ready? 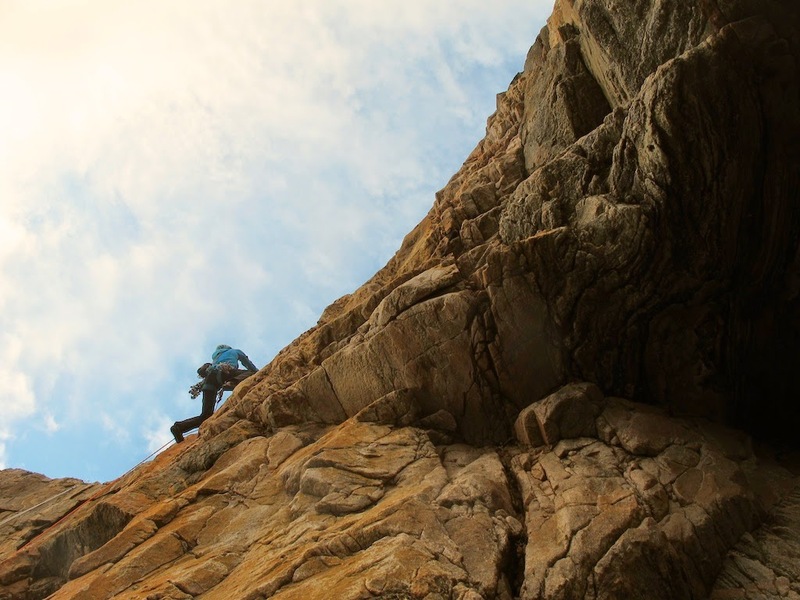 When she arrived at the belay, it was obvious she was determined to go for it. Once she set off, her movements across the wall made it even more obvious. She was going up this pitch no matter what. It was great to watch. Natalie setting off on pitch 4 of The Prozac Link, E4, Screaming Geo. View from the Hot Aches Productions camera of Natalie leading the Prozac Link, E4. The next day we returned to Ard Feinis with the E7 wall in our sights. It was damp and already raining. But I was totally psyched to do it if at all possible. Natalie linked it on the top rope with ease but still opted to pass me the lead until she had more experience placing the few crucial small cams that only just protect it. The rain got heavier and heavier, so there wasn’t time to lose. I kept my chalkbag dry by tucking under my top until I was under the crux roof before flinging it off, drying my hands and feet and launching up the wall. Apart from a few seconds off faff drying my hands after fiddling with rainsoaked cams, I enjoyed every second of the wall, especially grabbing the monster bucket wet jug at the top and throwing on my pre-stashed Gore-Tex jacket. A first E7 since coming back from surgery and a good milestone in regaining my confidence. Nat seconded into a faceful of drips from the top of the wall, and we scurried back to the car to thaw out, happy. I don’t know whether it’s because I’ve had a nice rest this week with lots of sleep after all those 16 hour building days at home, because I’ve been back to climbing, or because I’ve been climbing in inspiring surroundings all week, but I feel a burst of energy right now. I’ll have to use it for something good.